Today I’m thinking about pictures. Which is not unusual for me, actually. I think about pictures a lot. I just love the idea that you can capture a moment in time in this paused form to show to people years and years later. Today, though, I’m specifically thinking about wedding pictures as a friend of mine recently put up her own, and then proceeded to write a blog post about them. On top of that trigger, my memories have informed me that one year ago my husband and I went out with a good friend of ours and took anniversary pictures all dressed up. I’m sure I’ve talked about that experience before, but why not again? Now that I have been through a couple weddings as both bride and bridesmaid and reader and guest I have a few thoughts about wedding photography and it’s proceedings. Let me start by saying that there isn’t a wrong way to do things. Do what’s right for you. 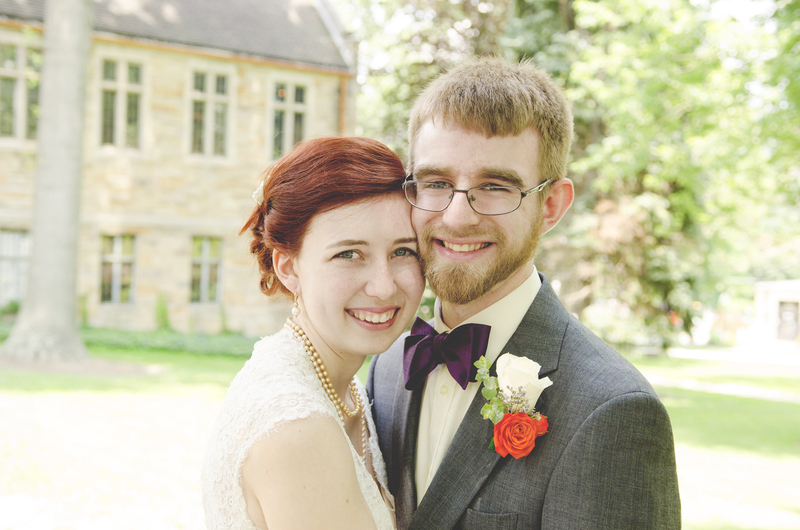 Let me continue by saying that my wedding pictures were awesome and my photographer, a close family friend, was awesome. I am not dissatisfied with her or her pictures in any way. That being said, I wish I had done them differently. I wish I had done the whole wedding differently as far as time management goes, but that’s the problem with being first, you kind of have to feel your way through things. We decided on an afternoon wedding and I wish very much that we had done a morning one instead. I didn’t know about morning weddings until my best friend got married a month and a half later and they’re great. I didn’t want to make my family and friends wait too long, though, so I wanted to do pictures before the wedding. While this did allow for a quicker wedding to reception transition, it was also more stressful because we had a time crunch and the wedding looming over us, instead of just the time crunch of not keeping guests waiting in a nice cool room with cheese and veggies and cookies. Seems kind of silly now, but hind sight is twenty-twenty. If I were to go back, I would tell myself that I don’t want to spend a half of my wedding day not married. Get the important part out of the way and then take the pictures. The guests will happily wait with their snacks. My one regret as far as the original wedding pictures go is that my husband and his guys didn’t get the attention they should have. I was so caught up in my own picture list that I didn’t think to tell Logan to make one as well. I asked my photographer to take pictures of the guys while I was waiting on my mom to help me get dressed and she said she had already taken them. I didn’t question her and later found out Logan hadn’t gotten the pictures he had wanted. I just assumed because one of his groomsmen was also taking some pictures for us that he had thought of things for them as well, but that was not the case and I feel really badly that I over looked the whole thing in my planning. My wedding pictures turned out beautifully. There are so many that I love, but there are also those that I look at and it’s clear that my smile is for the camera. There are genuine smiles in there, there are some great candid shots and some real laughs, but the whole shoot was underlined with stress and exhaustion and a sense of “get it done so we can move on to the next thing.” They’re beautiful and fun and I love them, but you can tell on my face and Logan’s that we’re a little lost in the whole experience. That wasn’t part of my initial anniversary shoot reasons, but in hind sight, it’s another reason I’m glad we did them. I always wanted a fall wedding. I wanted to get married when the leaves were brightly colored and littering the ground and we would crunch through them as we walked out and could play in them in pictures and the whole world would be orange and yellow behind us. I also didn’t want to wait that long, and July 12th, as our second dating anniversary on a Saturday was just too good to pass up. 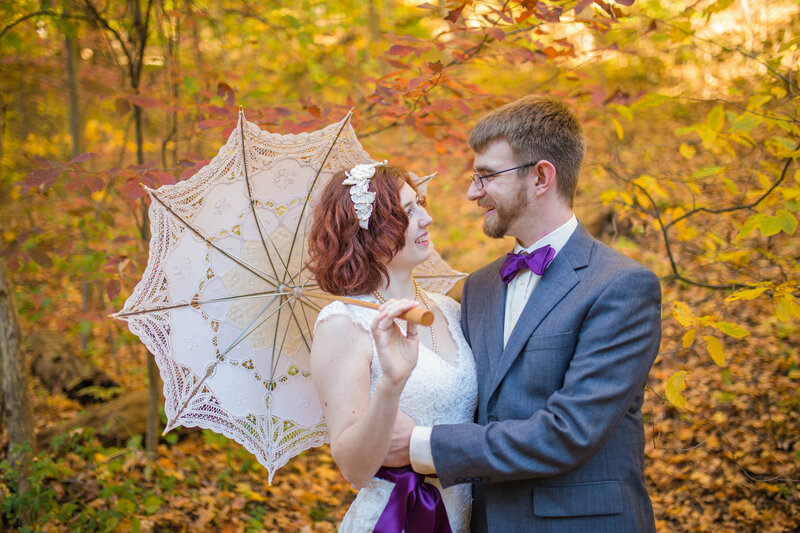 So to make up for missed opportunity I managed to talk my husband into doing a photo shoot with me in our wedding clothes in October with our beautiful friend Lindsey. One year ago today we went out and adventured in Frick Park where the leaves were awesome and took a bunch of pictures. I have to say, the experience of just us taking pictures with her was way more enjoyable that the process of taking actual wedding pictures. I look at the pictures from our anniversary shoot and there is nothing but real smiles and a little bit of mischief. I would highly recommend putting on your wedding clothes again and grabbing someone to take some pictures of you. Specifically Lindsey Zern Photography, because she’s wonderful, but seriously, it’s a good time and you get happy pictures from it. It was pretty funny, actually, dressing up in my wedding dress and walking around Frick on a random Monday with my husband getting our pictures taken. We got lots of people congratulating us on our marriage, which was funny as we’d been married a year and three months at that point. We had a guy walking past asking where the wedding was and we had to explain that it was in Beaver Falls, like a year ago, to which he rather awkwardly fumbled with “Well it’s better late than… sorry?” and walked on. The anniversary pictures are some of my favorite pictures of us ever, and I’m so pumped to have them. 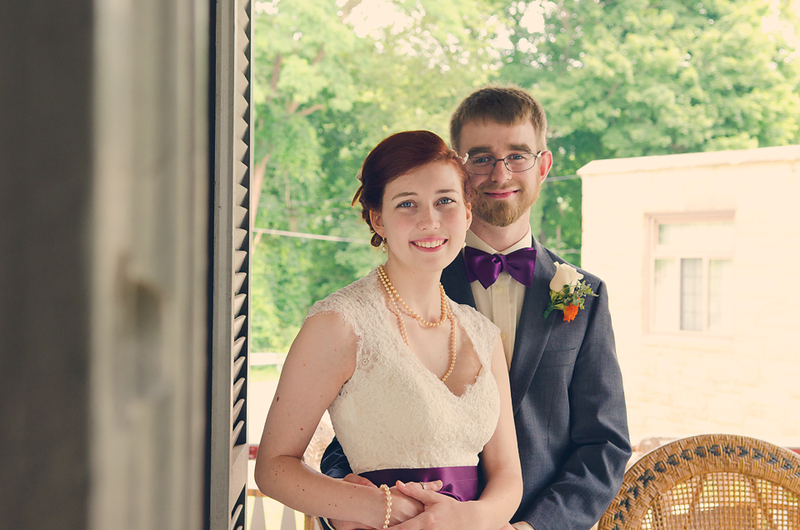 I’m also still very much in love with my wedding pictures. I love our first look photos and the shots captured of us walking down the aisle for the first time as man and wife. I love our dancing pictures and cutting the cake together and the moments captured from that day. I love that I can keep the look on my dad’s face as he saw me in my dress, just passing through the church entryway. Even if the experience was stressful, I will always treasure my wedding pictures.